Now could be your chance to score a nostalgic Toronto souvenir, but you'll have to get in line. Photo by wyliepoon, from the Torontoist Flickr Pool. What happens to old street signs when the City removes and replaces them? Perhaps unsurprisingly, most of them get sold for scrap. But now city council has an opportunity to make sure some of them get set aside for members of the public to buy. 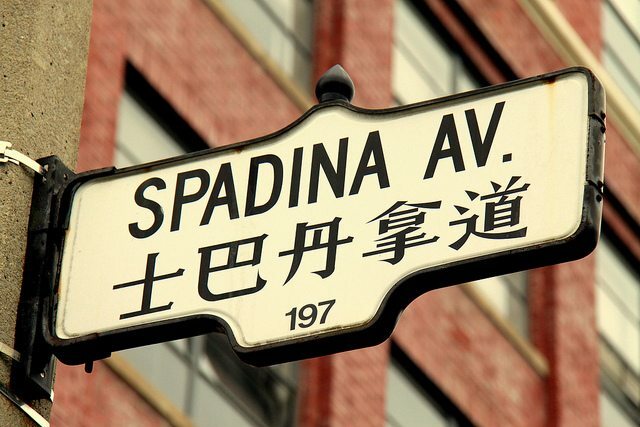 A proposal that goes before council’s public works and infrastructure committee on Wednesday calls for the City to set up a website where Torontoians can browse an inventory of decommissioned street signs and place orders for the ones they want. The proposed price for each sign is $30. True, it’s more expensive than tearing one off a pole, but it’s cheaper than the eight beers you’d probably need to drink before doing that seemed like a good idea. The City currently has about 950 decommissioned signs in stock. Included among them are many victims of the City’s efforts to replace older styles of signs with the new, standard blue-and-white ones. This could be your big chance to get a nostalgic, acorn-topped street sign (like the one in the picture, above) of your very own. If city council gives final approval to the idea at its meeting in June, we could all be buying signs as soon as late July or August, according to estimates from City staff. The notion was first formally proposed by Councillor Adam Vaughan (Ward 20, Trinity-Spadina) over a year ago. The City has been keeping a wait list of requests for different signs. Right now, according to Allen Pinkerton, manager of signs and markings, the line is about 2100 requests long and growing, recently, at an average 300 requests per day. The streets below are currently the ones that have been requested the most. These numbers, which come from Pinkerton, are running totals. Could it be that Queen Street has twice as much nostalgia value as the next-most-nostalgic street in Toronto? That’s what the stats seem to suggest, at least for now. To get on the wait list, send an email to [email protected] and include all the pertinent information: what signs you want, who you are, where you live, and how to get in touch with you. UPDATE: May 16, 2013, 2:50 PM It looks like the wait for signs will be a little longer than anticipated. The public works and infrastructure committee sent the idea back for further consideration on Wednesday, partly so City staff can figure out how to handle unexpectedly strong demand from the public.